Kids Sword Combat: Is it Useful for Self Defence? Kids love to compete in sword combat. 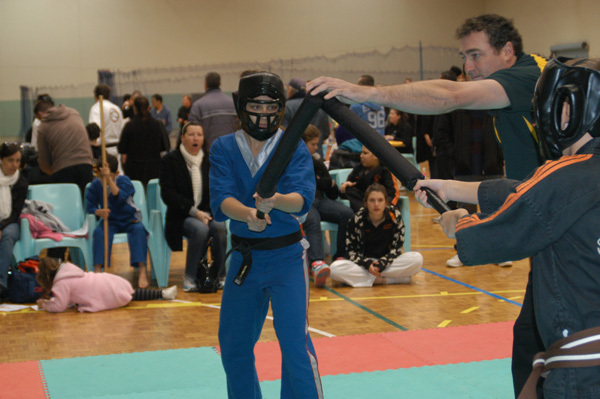 Kids sword combat is a popular event of International Sport Karate Association in Sydney, Australia. Our tournament team, Kenpo Freestyle Sydney, has been the number one ranked team in ISKA Australia karate tournaments for five years in a row. We train our team members how to excel in sword combat. But how does it help kids learn self defence skills? Is it practical? What are the benefits of sword combat for kids? 1. Strengthens both arms. You hold the sword with both hands and use it to strike, thrust, and parry. This builds coordination and strength in both arms. 2. Develops quick reflexes. The weapon moves faster than someone’s fist and it has more reach. You must be quick to block it or evade it. 3. It teaches you how to read an opponent’s attacks. You will learn how your opponent moves as they are getting ready to attack, and this will help you to avoid them. 4. It develops an understanding of how to block an attacker’s weapon, not just how to strike. By learning the attacks, you will also learn the defences. 5. It teaches fast footwork for self defence. You will find that if you don’t move around you will be hit with the sword easily. By staying light on your feet you can attack and retreat much faster. 6. It enables a smaller person to defeat a bigger person with speed and technique. Speed and technique are more important than brute strength in a self defence situation. 7. It burns off stress and energy without hurting anyone. If you are wearing proper safety equipment and the sword combat sparring is controlled by instructors, it is a safe and fun way to release tension and get some great exercise. I hope you can see the benefits of sword combat for kids. Can anyone think of any other benefits that were not included on this post? Please feel free to leave your comments. Welcome to the first post in my new blog. Since this is about beginnings, I thought I’d write about what it’s like to be a white belt again. Yes. Me. I am a white belt again—in building websites. The site at which you are now looking was built by yours truly. What does this have to do with kids karate you ask? As it turns out, a lot. Sensei Matt became a white belt again--in building websites. And the language. There was HTML, CSS, Photoshop, W3 Validation, FTP, etc., etc. It might as well have been hieroglyphics. How do you get problems solved when you don’t know the language? Well, I had to learn. There were online tutorials, books, forums, and conversations with experts. It is amazing how many people want to help if you just ask for their advice. I now have great respect for people in this field; they must know so many things. There were so many times I was tempted to throw in the towel. Hire someone to do it for me. But, like any white belt, I enjoy a challenge. Each time I encountered a problem, I found a way to solve it. It might have taken me a day, or even a week, I didn’t care. There was always a solution. Each time I found a solution my confidence grew. And guess what? I learned a lot. When I walk through the class as we are practising a kata, I see the looks on the children’s faces. Utter frustration, the “I will never get this” look. I can now better relate to their feelings. I can now see what kind of Sensei they need. They need someone like that kind patient person on the web hosting help line that got me through a tough, frustrating time without making me feel like a complete idiot. Let’s face it. In the website development world I am a nobody—a big zero. But I’m learning, and part of the joy of learning is exploring the unknown, overcoming the fear of failure, and reveling in our new knowledge. Learning new things is what keeps us young at heart. I will probably never be a black belt in building websites, but I am still learning and I will not give up. What did I learn from all of this? I learned that everyone should become a white belt again just to feel what it’s like to be someone just starting out on their journey. More than anything, this experience has taught me about patience; with myself, as well as with others. And white belts; never be afraid to ask for help. 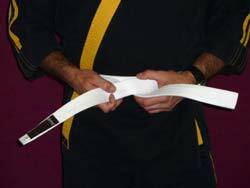 Kids Karate Sensei Becomes White Belt Again is an original article from Sensei Matt Klein. For more information check our kids karate classes in Sydney.